National Wine Day is approaching (May 25) and Nashville Wraps is ready to supply all your wine packaging needs! We’ve rounded up four wonderful, and better yet, EASY ways to wrap wine bottles. Read on for details! 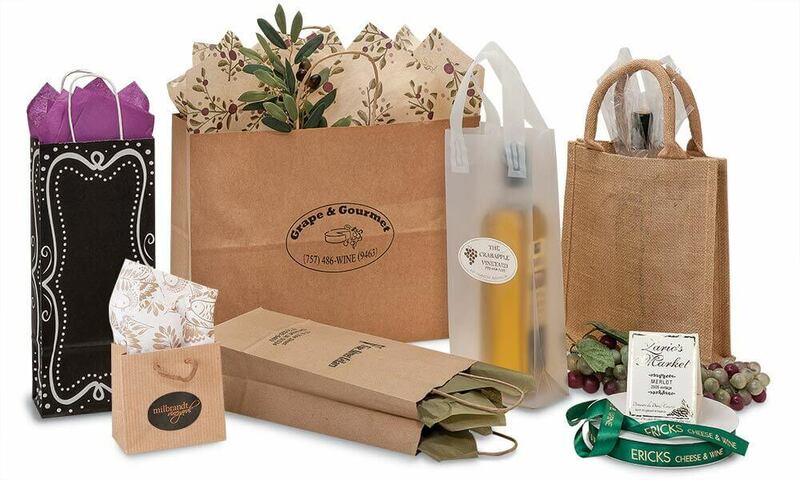 Try a pretty printed kraft shopping bag like our Tuscan Harvest design (shown above). Choose a playful gift tote like our Gold Dots. Select an elegant sheer organza wine bag. Reach for a minimalist cotton drawstring bag. Or opt for a sleek, sheer plastic bag with a sturdy bottom insert and a handle for easy carrying. 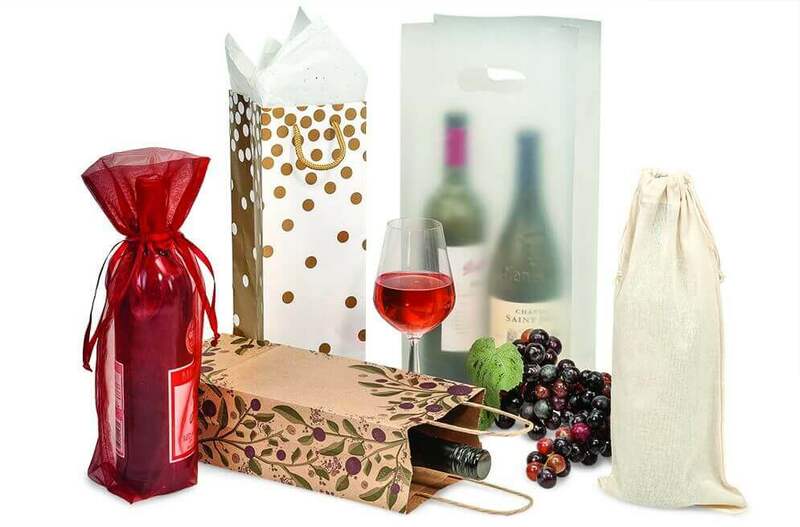 Wine bags are possibly the easiest and most versatile way to wrap a wine bottle in style. Shown in this blog are just a few of our many wine bags. Click here to shop all Nashville Wraps wine bags. Cello is one of the easiest, most cost-effective ways to gift wrap a wine bottle, particularly when combined with a pre-tied bow! Try a sheet of printed cello, such as our Jewel Swirl Frosted Gold, finished with a Pre-Tied Sheer Gift Bow. 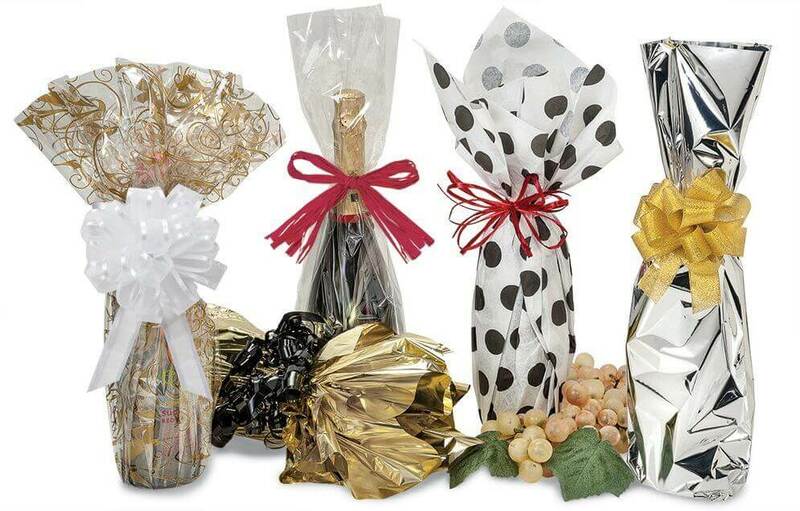 Our Metallic Wine Bags in either gold or silver look fabulous with a Metallic Gold Pull Bow or curling ribbon. And Clear Cello Wine Bags look so elegant tied with just a simple pre-tied raffia bow. A couple of sheets of printed tissue, such as our classic black & white polka dot Domino Alley tissue (shown above), can be used to wrap a wine bottle as well as cushion it from breakage. Complete the look with a bold red raffia bow. See this blog (or watch the video above) for a great way to combine tissue paper and cello to create a gorgeous wine gift presentation. Perhaps you want to add a simple printed sticker to the front of a bag or box. Or maybe you want custom printed wine bags and personalized ribbon. We can help you create the look you desire! Click here to find out more about our custom printed packaging. You can also reach us at 1-800-547-9727 or email us here. We have more wine packaging than we could possibly show in one blog. Click here to shop all food & wine packaging. Priscilla Medders is a graphic designer who lives in Nashville. She enjoys singing and playing music with her husband, Cheyenne Medders. In addition to contributing to the Nashville Wraps Blog, she also blogs about wellness.